Gerhard “Gerd” Friedrich was born on 16 September 1917 at Berlin-Johannisthal. Friedrich initially served as a transport pilot. He participated in the invasion of Crete with KG z.b.v. 106. He underwent conversion training as a night fighter pilot and was posted to III./NJG 1 at the beginning of 1942. Friedrich claimed his first victory on the night of 16/17 June when he shot down a RAF Wellington twin-engine bomber. By October 1942, Oberleutnant Friedrich was serving with II./NJG 2. He gained at least one victory with this unit, when he shot down a RAF Halifax four-engine bomber near Bar-le-Duc on the night of 24/25 October as his fourth victory. Friedrich was serving with 8./NJG 4 by December 1942. He gained one victory with this unit claiming another Halifax shot down near Courouvre on the night of 6/7 October as his fifth victory. On 1 January 1943, Friedrich was appointed Staffelkapitän of 10./NJG 4. Friedrich gained a further three victories with 10./NJG 4. However, on the night of 16/17 April, his Bf 110 F-4 (W.Nr. 4755) was hit by return fire from RAF bombers he was attacking and he and his bordfunker were wounded. Both managed to bale out of the stricken aircraft near Hochspeyer. On 1 August 10./NJG 4 was redesignated 1./NJG 6. On the night 25/26 February 1944, Hauptmann Friedrich claimed a RAF Lancaster four-engine bomber shot down near Seeburg as his 10th victory. Friedrich was appointed Gruppenkommandeur of I./NJG 6 on 12 July 1944. He had 18 victories to his credit at this time. On the night of 11/12 September, Friedrich claimed a Lancaster shot down near Darmstadt to record his 20th victory. He claimed four Lancasters shot down near Pforzheim on the night of 23/24 February 1945 (26-29). On the night of 14/15 March, he claimed a further three Lancasters shot down (30-32). On 15 March 1945, Friedrich was awarded the Ritterkreuz for 29 victories. On the night of 16/17 March 1945, Friedrich collided with a RAF Lancaster four-engine bomber near Stuttgart at 21:00 hours. Friedrich and his crew were killed in Ju 88 G-6 (W.Nr. 621801) “2Z+LB” along with the seven crew of the British bomber. 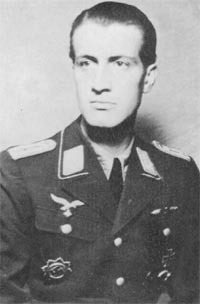 “Gerd” Friedrich was credited with 33 victories. All his victories were recorded at night.